Last year’s BlobFest Re-enactment runout at the Colonial Theater was a runner-up in this year’s Rondo Awards for Best Fan Event. The Vincentenial, a celebration of Vincent Price’s 100th birthday held last May, won the category. The Women in Horror Month and Scares That Care also received runners-up status. 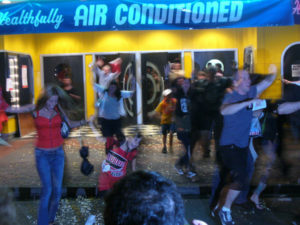 The Runout Re-enactment was one of two categories that last year’s BlobFest was nominated in. This entry was posted on Wednesday, April 25th, 2012 at 12:08 pm	and is filed under BlobFest. You can follow any responses to this entry through the RSS 2.0 feed. You can leave a response, or trackback from your own site. Maxblog | Design: NET-TEC Artikelverzeichnisse of Biokost. Coding: Kinderspielzeug of Massivhäuser.